How to dream your desired dream. Why you dream of new experiences? You are most likely to dream about something which you engaged in, about one and a half hours before sleep. If you want a pleasant dream, you should spend time on reading a good book, watching a happy show, or listening to soothing music. Researchers who investigated this hypothesis, found that the brain may activate the recently used memories, to dream on the same night. 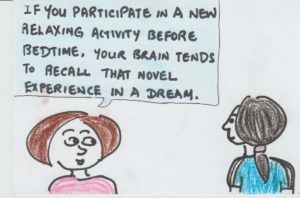 If you spend time doing something new, like playing a new board game, clay modeling, painting or craft work, your brain may recall this novel experience, and trigger a dream. Previous Post:Does a dream catcher work to catch dreams?